GEN-Y Hitch has been revolutionizing the hitch industry over 5 years now. With so many of the benefits of an "air ride" hitch built into the design, yet with out the cost and bulk! If Your Horses Could Talk, They Would Ask You For The Gen-Y Hitch! Your horse has been meaning to tell you something. He needs you to buy a better hitch. You have been training and showing him, but the bumps are getting to not only be a nuisance, but that last bumpy dirt road nearly sent him to the floor! You sit the truck with the nice suspension system, seat belts, air conditioning and radio- while he is fighting bumps, turns, jolts and pot holes… you arrive refreshed and ready to perform— your horse needs two days off just to recover! Well… with the Gen-Y Hitch that scenario is a thing of the past! The Gen-Y Hitch Started Off As An “Idea”— and Revolutionized Hauling Forever! 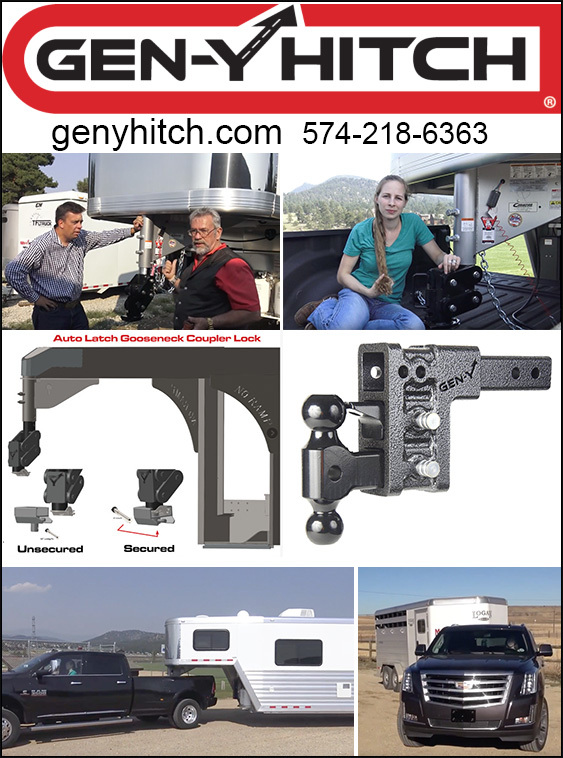 Gen-Y Hitch was formed in 2011 by Carl Borkholder and were based upon the involvement of Carl in the recreational vehicle industry centered in nearby Elkhart County, Indiana as well as Carl’s involvement in the ownership and operation of a business and the inconvenience of not having a hitch system which was compatible among all the trucks and towable units necessary for the company’s operation. As a result of this incompatibility, crews were constantly forced to make special arrangements to make sure their vehicle could pull the particular trailer necessary for a particular job. There Are 3 Good Reasons You Need The Gen-Y Hitch! You have invested a lot of money into your trailer and horse, and though the right hitch might cost a little more, it will be worth it in the long run. In fact, it's worth it in the short run too! Side note: if you get the right hitch, you can save enough money in gas savings alone to offset the cost of the hitch. Think of it as a "pay me now or pay me later" set up. Better yet, think of it as a pay me now or WISH you had paid me now!! The right hitch offers mitigation of the inertia between truck and trailer, which, simply put, means that your horse, your trailer and your truck won't be mitigating that inertia any longer! The movement that happens as a result of these road imperfections can create a TON of stress on your horse, and non some cases injuries can be the result. We know your horses come first, but we also know you have a pretty penny invested into that expensive horse trailer! The right hitch means that your trailer will stay nicer for your horse for a longer amount of time. Think about it this way, your horse, your trailer and your truck are an investment, right? Why wouldn't you want that investment to stay nice as long as possible? Guess what? Your horses would like it to stay as nice as possible too! They spend a lot of time in there! 3. Smoother Ride Means You and Your Horses Arrive Ready To Perform! Finally, the right hitch means that you and your horses can arrive at the destination feeling relaxed and ready to go— either on a great trail ride or into the show ring. Anyone who has ridden in a vehicle that has had the wrong hitch pulling any significant amount of weight will tell you that it can feel like you have just been beat up— and your horses will feel the same way! Eliminating that with the proper hitch is crucial to making sure that you arrive rested and ready to go— after all, that was the whole point in the trip! It True That The Gen-Y Hitch Replaces The Need For An Air Ride System? How? What If I Have a Gooseneck? Is There A Gooseneck Version? There sure is and it is just every bit as amazing! We launched the GEN-Y Gooseneck Torsion Coupler in August of 2017 and shortly thereafter it won 1st Prize NATDA New Product of the year Showcase. * Increases Your Quality of Life, You Deserve a Gen-Y Torsion Hitch and MORE! Is Gen-Y Hitch Easy To Install? Any of our hitches replace factory hitches or would insert easily into your existing receiver/coupler tube. Just give us a call, and we’ll make sure you get everything you need to know how to get the Gen-Y Hitch installed. Once you use it, you’ll wonder how you and your horses every got along without it. Is It True That The Gen-Y Hitch Can Help Me Save Gas On Hauling? Oh yes! With far less jumps and jolts on truck and trailer and with up to 90% inertia mitigation, our clients often report far better gas mileage and less maintenance costs! Is It True That The Gen-Y Hitch Comes With A LIFETIME Guarantee? You bet! Each of these adjustable drop hitches comes with a lifetime guarantee! You’ll absolutely love it! The Gen-Y Hitch Can Save You Money and Protect The Horses You Love— Order Today! Few things cost more than ‘regret’. It only takes one good pot hole to “pop a splint”, or cause extra stress to your horse— ruining your trip and sending the vet out. When you are on the road, you are at the mercy of your hitch— if you own a Gen-Y Hitch— you have a hitch that takes control of the road- in ways never before possible! Call us today— let us help you. You’ll love the Gen-Y Hitch and so will your horses!